Note: Inuit data is not included within given Aboriginal data. Adapted from Statistics Canada http://www.statcan.gc.ca/pub/71-588-x/2011003/t006-eng.htm, accessed January 15, 2012. In 2010, the unemployment rate for First Nations youth living off-reserve was 26.9% and the rate for Métis youth was 16.9%. The comparable rate for non-Aboriginal youth was 14.6%. 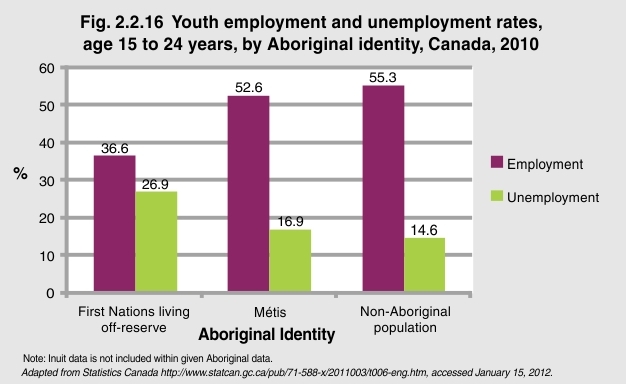 The employment rate for First Nations youth living off-reserve was 36.6% while that for Métis youth was 52.6%.